We’d love your help. Let us know what’s wrong with this preview of The Storyteller's Throne by Jocelyn Bates. Published May 14th 2018 by Arts Etc. 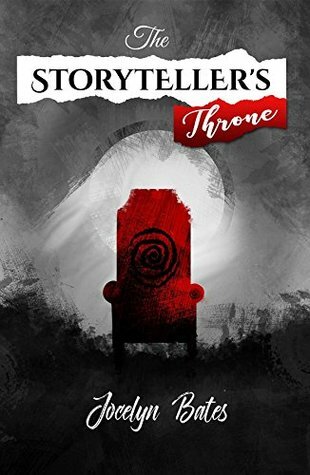 To ask other readers questions about The Storyteller's Throne, please sign up. The Storyteller’s Throne is a quick read, and not just because of the fast pace. The descriptions are a whirlwind, heavy and intrusive. I felt overwhelmed by the imagery. Grace as a main character was frustrating. To me, she wasn’t fleshed out beyond ‘Mary Sue’, even though the whole point of her storyline was to discover herself. She ‘rediscovered her trauma’ (read: was forced to watch her six-year-old self suffer sexual assault) in a scene that was intensely uncomfortable to read, not only because of the content, but because of the way in which it was written. Her ‘shadow self’, Anika, was an indulgence who served no purpose as far as I could see. Kai seemed forced, especially due to the oh-so-shocking ‘twist’ at the end where the pair would not be allowed to stay together in the real world, despite their soulmate status. The whole plot seemed to be a vehicle for the author’s agenda, which ruined what could have been an interesting concept. On top of this, the writing could do with a good copyedit; there were some very distracting errors. The characters, plot, and pacing were all This is beyond just a Sci-Fi novel, it had a how did the world begin theme to it. Jocelyn Bates has brought to life very multi-dimensional characters and given them a purpose. The world she has created is so vivid and really helps the reader feel like they are there with the characters.